BMW's plant in Spartanburg, South Carolina, has produced about 2.5 million vehicles since 1994. BMW's U.S. factory is on track to become the automaker's largest -- passing its plant in Dingolfing, Germany -- with the addition of the X7. 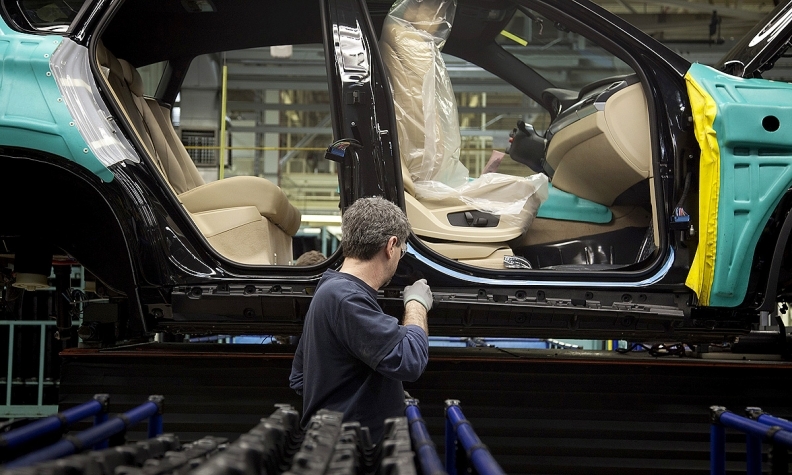 On Friday, BMW outlined plans to build the seven-seat crossover in Spartanburg, South Carolina, and expand annual capacity to 450,000 units. "This expansion means Spartanburg will have the largest production capacity of any plant in our global production network," BMW CEO Nortbert Reithofer said in a statement. BMW's Dingolfing plant was the automaker's largest producer last year with a volume of 342,600 models such as the 5-, 6- and 7-series sedans. Spartanburg ranked second in BMW's global network with a 2013 volume of 297,300 crossovers such as the X3, X5 and X6. BMW sales boss Ian Robertson told Automotive News Europe in January that Spartanburg already was on track to become the company's largest plant because of this year's addition of the X4 crossover. Since producing its first car 20 years ago, the Spartanburg factory has been expanded to rank as the industry's biggest producer of vehicles exported from North America, according to BMW. The flexible, high-volume plant is the German automaker’s "center of competence" for crossover production, Reithofer said. It has also played a key part in BMW’s nine-year reign as the world’s best-selling luxury brand, a title being challenged this year by Volkswagen Group’s Audi. The X7's top sales market is expected to be the United States. BMW’s first and only factory in North America, Spartanburg has produced about 2.5 million vehicles since 1994. BMW has invested $6.3 billion at the site since 1992, when construction began. • Sept. 26, 2002: In 10 years, factory had grown to 2.4 million square feet. BMW announces $400 million investment and 400 new jobs. • March 10, 2008: BMW announces a $750 million investment to add 1.5 million square feet to produce the BMW X3. • Jan. 12, 2012: The factory had grown to 4 million square feet. 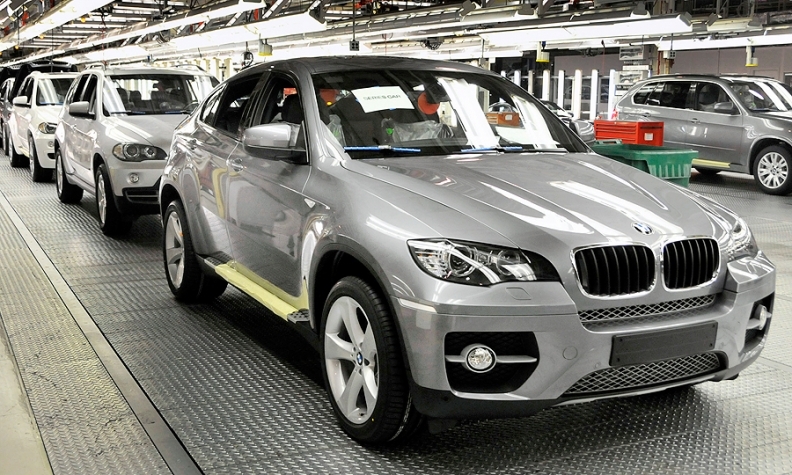 BMW announces $900 million investment and 300 new jobs in preparation for the X4. Spartanburg is one of BMW’s most flexible factories, using a two-line assembly system that allows quick adjustment to market demands and allows the plant to totally build to order. Last year, it exported 71 percent of its annual production -- 201,760 of a total build of 297,326 crossovers. BMW X6 production was launched at the South Carolina plant in 2008. BMW cancelled X7 development in 2008, at the height of the automotive market’s collapse. But with demand for larger crossovers now growing in the United States, BMW decided to restart work on the X7 instead of increasing the size of the redesigned X5 that went on sale last year. The X7 is expected to go on sale in 2017 or 2018 in the United States, filling a gap in BMW’s lineup. The large crossover would compete with the popular Mercedes-Benz GL and rumored Audi Q9, as well as the Lincoln Navigator and Cadillac Escalade. The X7 will be based on one of BMW’s two new vehicle architectures, and will share parts with the other X vehicles and larger passenger cars. The new architecture gives BMW better economies of scale and allows it to launch vehicles faster than in the past, companies executives have said. The X7 will have a full third-row seat. Dealers have been clamoring for a larger crossover, saying the X5 is too small for some U.S. buyers. Last year BMW sold 1.66 million vehicles worldwide, setting a new sales record. The company has a group target of 2 million in sales by 2016. Last year, the United States accounted for 19 percent of the BMW Group’s sales, slightly below China’s 20 percent. BMW sold 309,280 vehicles in the United States last year and one-third -- 102,502 units -- were crossovers.